Christmas came early. My first re-married Christmas is off to a fine, fine start. This is my gift from the Mrs., a 10 weight. Just what I wanted. I went back and forth between a 10 and 11, but in the end I settled on the 10. I’m excited to find something to throw this at. I got a Redington to stay true to my “cheap is good” beliefs. I think this is a fine stick and I look forward to feeling something big and nasty pulling on the other end. My new rod. Happy to welcome it to the family. 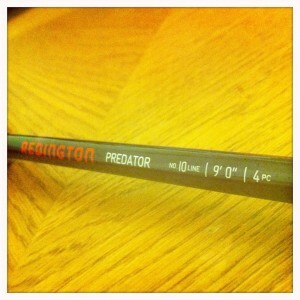 This is not the first Predator I’ve had my hands on. I caught my big (for me, anyway) Cuba tarpon on a Predator 11 and I cast a 9 in Hawaii (unsuccessfully) back a year ago. So, we have some history. This stick is workman like. It is not overly fancy (although it is blue and my daughter loves blue), but it is just a good, honest rod at a pretty decent price. This rod will be with me for a long time and that is good value:money. This entry was posted on Friday, December 14th, 2012 at 1:57 am	and is filed under Gear. You can follow any comments to this entry through the RSS 2.0 feed. You can leave a comment, or trackback from your own site. Those rods are sweet, and I like your wife more and more every day. Me too Andrew… me too.